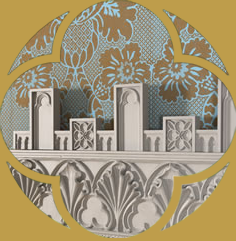 Strawberry Hill House & Gardens is a bright, airy, colourful space, full of quirky features and gothic details. Within easy reach of central London, Strawberry Hill is a stunning space for entertaining and can host a variety of events. Our beautiful gardens, grand Gallery and smaller, more intimate spaces make Strawberry Hill the ideal venue for weddings, corporate events & private parties and an intriguing film location. All income generated through venue hire contributes to on-going outreach, education and restoration work at the House. Strawberry Hill House is delighted to be partnered with the events and catering team at Bovingdons, who have over 30 years experience in delivering exceptional food, seamless service and trusted event delivery. 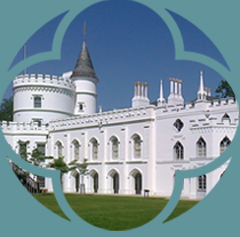 If you require any details on hiring Strawberry Hill House for your event please contact our event team. For all film and photography hire please contact Valerie Beard: hire@strawberryhillhouse.org.uk / 020 8744 1241 ex. 206. Strawberry Hill House is the perfect venue for your wedding, with our wonderfully lavish Gallery acting as a truly unique setting for a civil ceremony or civil partnership that your guests will certainly remember. We have a room for every occasion, ranging from conferences and dinners to parties and receptions. We have many options for private dining. With vast halls and ornate gilding, Strawberry Hill House has an air of mystery and glamour and offers a varied site for professional filming. Our building and landscape have been showcased in magazines such as Vantage, Vogue Japan, Kensington and Chelsea Magazine and Richmond Magazine.